Sharing with everyone my harn (hosiery yarn) scrubbie pattern I designed. Harn scrubbies are absolutely awesome. I have made scrubbies out of just about every type of fiber and never satisfied. You will love your harn scrubbie. I created this particular crochet pattern, 'Protect My Nails' to protect my nails while doing household chores. Size G Hook or hook of choice. Chain (ch) 13 or number of chains needed to measure across all 4 fingers pressed together. Row 1: Half double crochet (hdc) across to end, ch2 turn. Row 2: Hdc in back loop (bl) only across to end, ch2 turn. Repeat Row 2 until panel measures from tip of fingers to top of hand or desired length. Fasten off and weave in ends. 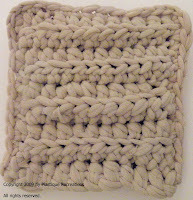 With wrong sides together at lower corner (right or left, you choose) single crochet (sc) through both panels in corner stitch and in each stitch across to next corner. Make 3 sc in corner and a sc in each stitch across to next corner. Make 3 sc in corner and a sc in each stitch across to opposite lower corner. Fasten off and weave in all ends. It's ready to use when you are. Copyright 2009 Plastique Recreations. All rights reserved. Create Crochet Team Promo Madness Sale!!! !